This 1975 Sterling Sgian Dubh has all silver fittings and is hallmarked. The sheath has a Celtic knot work design. Around the pommel, there are fittings in a silver twisted rope design. You will find the same design on the base of the grip. 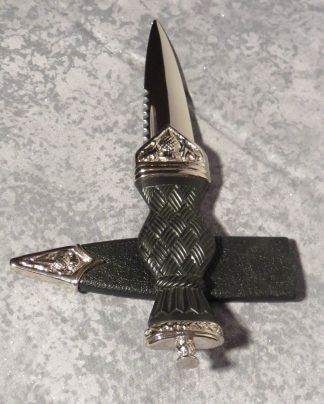 This 1975 Sterling Sgian Dubh has silver fittings on the sheath and knife. The front and the back of the sheath have sterling silver Celtic knot work. The pommel has a blue stone with a silver twisted rope fittings around its base. This same design is around the base of the smooth wooden grip. 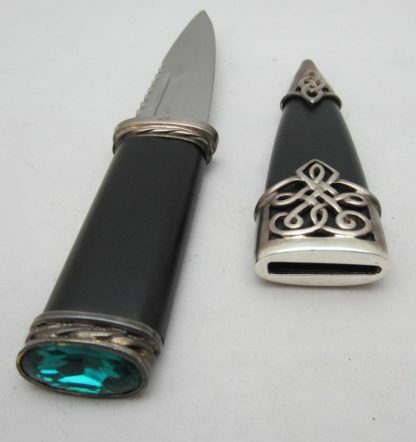 The sgian dubh has a sterling silver hallmark.